Work got underway Tuesday to remove the Bloede Dam, in Patapsco Valley State Park along the Patapsco River. The Maryland Department of Natural Resources has been working to plan the dam removal for five or six years. The agency says getting rid of it will be safer for the public—injuries and deaths have happened near the dam. It will also allow shad, herring and American eels to migrate, as they once did, on the Patapsco River. The dam blocks the historic migrations, and DNR says the fish ladders that were built in the 1990s have proven ineffective. With the dam gone, fishing and swimming will be easier and safer, according to DNR. Crews began staging for construction and closing trails in the park on Tuesday, September 5. Sections of the Grist Mill and Buzzards Rock trails will be closed along with portions of the Patapsco River from Ilchester Road bridge down to the dam. Park patrons, including anglers, bikers and hikers are encouraged to seek alternatives, either within the park or elsewhere. “While we know the project may entail some short-term inconveniences, we are confident that this restoration project will ultimately enhance the ecosystem and improve public safety once complete. We ask our guests and visitors for patience as we work to reclaim the Patapsco River and ultimately help restore the Chesapeake Bay,” said Maryland Natural Resources Secretary Mark Belton. The project is expected to cost between $15 and $17 million, and is scheduled to be finished in late spring 2019. The Bloede Dam was built in 1907 by the Ambursen Hydraulic Construction Company. Hydropower generation discontinued in 1932. 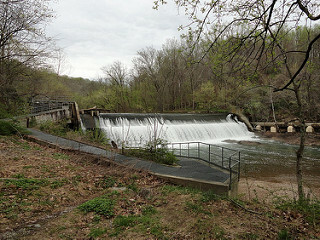 The dam and surrounding property was sold to the state in 1938, and later incorporated into Patapsco Valley State Park, which is managed by the Maryland Park Service. The impact and significance of the dam, the first known submerged hydroelectric plant to supply electricity, will be commemorated as part of the removal project in both Baltimore and Howard counties. Maryland DNR is working with Baltimore County, Howard County, the Maryland Department of Environment, Maryland Department of Transportation State Highway Administration, National Oceanic and Atmospheric Administration, U.S. Fish and Wildlife Service and the nonprofit group American Rivers on the dam removal project.